It’s truly the perfect time to get toddler backpacks when your kids already want to carry their stuff. Your little ones may already have their favorite snack and drink to bring around or a favorite toy to keep them company. And what better idea there is that putting them inside their cute little toddler backpacks? The idea of bringing their stuff, believe it or not, gives tons of excitement to your little ones. Just be sure you or your kids won’t put too many things inside, or they’ll end up carrying too much extra weight. There’s nothing happier than kids who are taking their most prized possessions with them in their tiny toddler backpacks. So to those parents who have kids that will be attending daycare or preschool, traveling, or just want to take fun trips to the park — a toddler backpack is essential, and we will help you choose the perfect one for your little kids. You can be confident in giving your toddlers a backpack when they already can carry stuff using their hands. Also, it is important that your little ones are already steady on their feet. Usually, when they become a year old, they can already carry a small backpack of their own. The bag for your toddler should have two straps so the weight can be evenly distributed. The straps should not have an uncomfortable hard edge that will dig into your child’s skin. Choose backpacks with straps that are padded and wide so that your kids will be comfortable in carrying them, even for longer periods. It is also a plus if the straps are adjustable so that you can customize the length of the straps to distribute the weight evenly. According to the American Academy of Orthopedic Surgeons, it is recommended that the backpack that your child constantly carries should not exceed 15 to 20 percent of your child’s body weight. However, on the side of the American Academy of Pediatrics, they recommend that the weight kids should be carrying will not exceed 10 to 15 percent of their body weight. Whichever recommendation you follow, it is important that you pick a lightly structured backpack so that your kids can put more items inside. You would not want a toddler backpack that already puts on so much weight even when it’s still empty. It is important that you take note of the dimensions of the backpack that you are buying. You do not want your toddler to be carrying a backpack that is way too big for their body size. As mentioned above, they also can wear big backpacks since they should not carry too much. 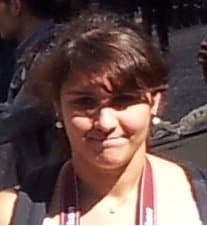 Note that top of the bag should be one to two inches below the top of the shoulders, and the bottom should not fall below the waist. A bag that is a bit too big will not distribute weight properly. This will eventually result in painful shoulders and strained muscles. A durable and backpack with good quality will truly last for years. A good backpack should have sturdy stitching, good zippers, and solid closures. Also, make sure that the straps and pockets are attached very well. For toddlers, however, you may need to replace the bags every year or two to make sure that the bag will fit them well since they grow up fast. 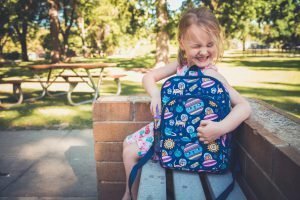 It is also nice to get your toddlers a few backpacks that they can wear alternately so that their bags won’t easily wear out because of excessive use. 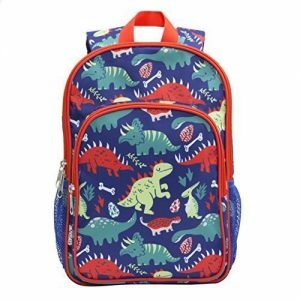 Similar to picking their rain boots, snowsuits, shoes, and clothes, it is important that you pick a backpack with a design that they will love. Otherwise, they probably will never use them. Many brands provide many options for toddler backpack. From bright colors, loud patterns, animal shapes, and even bags with the face of their favorite cartoon character. You can also add accessories to their bags for added fun such as colorful patches, pins, or zipper pulls. A reflective design on the backpack will also be great during times when you stroll around during nighttime. Reflectors will help your little one a lot more visible. If the bag they choose won’t have any reflectors, it is always easy to add reflective patches on your kids’ backpack. Pick a backpack with a reasonable price. It is okay if you spend a lot, if you can afford but remember that toddlers get easily get bored with things that they always use. That is why there are more chances that their backpack would get replaced more frequent than expected. You also need to consider if your toddler will be able to work with the zippers. You might need to pick ones with bigger zipper pulls or opt for magnet or velcro closures. Also, consider what your child might need to carry and get a backpack that will have enough space to hold their stuff. It will be easier for your toddlers to organized their things on their own if their bags have pockets and compartments. These pockets may come in handy for drinking or milk bottles or even their favorite toy. Dimensions: 11 x 5 x 12 inches. These backpacks are great for all the animal-lover little ones out there. 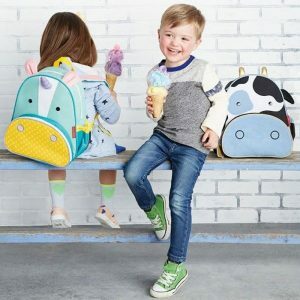 The Skip Hop Zoo is known for their cute animal designs on their toddler backpacks. They have a unicorn design which most kids love, that explains why this unicorn bag is one of the best sellers. These cute bags are made of durable materials with comfortable padded straps that will be perfect on little shoulders. Parents love how this bag has mesh side pockets that adjust to fit a sippy cup or any water or milk bottle. With a roomy interior, this toddler backpack can easily hold all the stuff your child needs. It also has a super convenient front pocket that is insulated, making it ideal for snacks. It also has inner pockets where kids can store their trinkets, crayons, and other tiny materials. This bag is phthalate-free and is made of lining that is very easy to clean. It also has a write-on nametag inside for easy identification. The design of this bag is super awesome with details that are artfully crafted; even zipper pulls are matched and intricately designed for your kids’ little hands. 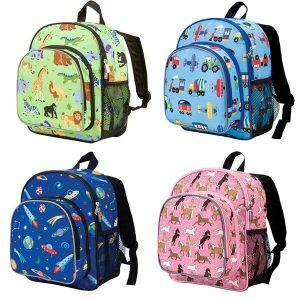 The Skip Hop Zoo toddler backpacks come in a wide range of designs; they have bees, monkeys, cows, frogs, and even penguins. Your kids can name their favorite animal, and the Skip Hop Zoo will have them in their range of designs. Dimensions: 8.3 x 6.7 x 3.5 inches. This 3D Rocket designed toddler backpack is one that your adventurous kids will love. It is made of lightweight neoprene that is very easy to wash and clean. One parent claimed that the bag got spilled with juice and tossed it in the wash, it got cleaned easily without the material getting damaged. The space inside the backpack is spacious enough to hold wipes, extra diapers, and a few snacks. It also has a cool transparent pocket where your toddlers can place their favorite toys or even place a good picture inside. Dimensions: 11.4 x 7.9 x 5.2 inches. 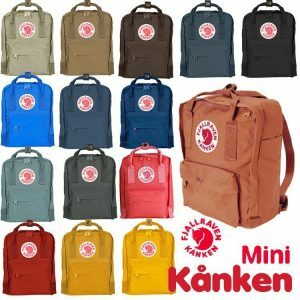 The backpacks by Fjallraven were created a long time ago to prevent back problems among Swedish school children. Seeing the good impact and how parents loved this backpack, Kanken Kids was then developed. The straps are attached in a way that it hugs the back, avoiding discomfort. The shoulder straps of the Kanken kids daypack is also magnificently tailored for comfort. It also comes with chest straps to keep the bag in place and avoid the shoulder straps from falling off. The handle is also sturdy enough and is made to be held easily. This is so that your toddlers can just carry them with their little hands when they eventually get tired of carrying the bags on their back. This bag is super lightweight and is very easy to clean and dry it is made of Vinylon F fabric that can withstand wetness, sweat, and dirt. 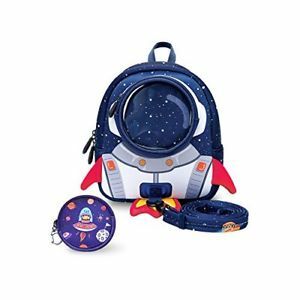 Your toddlers will be happy carrying this around at preschool, outings, or family vacations since this backpack will be able to fit their favorite toys, snacks, a change of clothes just basically everything they need. The main compartment, which also has an address label, opens widely which makes it super easy for the kids to pack and unpack. This bag also has some useful pockets and compartments plus a reflective logo on the front. Dimensions: 11 x 8 x 3.5 inches. 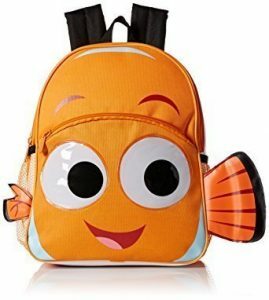 These licensed Disney character mini backpacks are perfect for all the Disney loving kids out there. They showcase a few of the kids’ favorite characters like Nemo, Spider-man, other superheroes, Anakin and Luke Skywalker, Disney Cars, Mickey & Minnie, Ninja Turtles, Paw Patrol, Elsa and Anna, and many more. So, your little adventurer has a lot to choose from. The backpack is made from 100% polyester. It is super easy to clean if it gets a bit dirty you could just wipe it with a damp cloth, and it’s all set. It has a main compartment that is spacious enough for your kids’ stuff and a front zip pocket for the snacks and little toys. 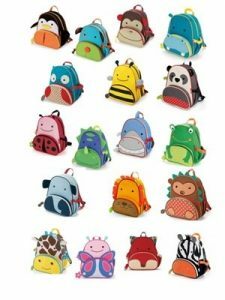 Those tiny backpacks are always a perfect choice for school, outings, or just a stroll inside the mall. They are lightweight and super easy to bring around and are very fun-looking and fashionable. Dimensions: 11.5 x 8.5 x 5 inches. This backpack does not only work best for adventures, but also for everyday use. The North Face has been known to produce high-quality equipment, and this kids backpack is one of them. These small bags are designed for toddlers and are built with youth-specific straps with Velcro sternum straps. 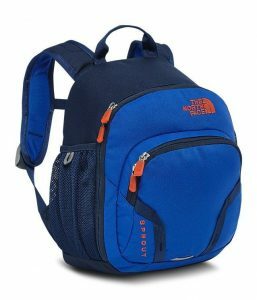 The North Face Youth Sprout backpack comes in five colors. It has external zip pockets for small items, trinkets, and snacks. This also has a mesh water bottle pockets. The main compartment is just perfectly sized for your toddlers and has an internal name label for easy identification. Like any other North Face bags, these tiny versions are super durable and will last for a long time. It is also a good choice when it comes to comfort. Since it has a stitched-foam back panel that adds comfort to your little ones. This backpack is also reflective to maximize your tiny adventurers’ visibility in low-light for enhanced safety. Dimensions: 13.5 x 9 x 3.5 inches. Just like the Lone Cone rain boots featured in the previous article, these bags are also adorned with super fun prints. 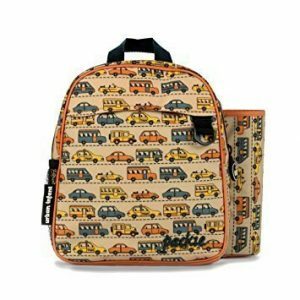 The designs are created by different artists and illustrator, so you’ll get unique and vibrant drawings on your toddler’s backpack. The perfectly illustrated designs of these bags spark your kids’ imaginations and can even brighten up their days. This Lone Cone canvas backpack has plenty of room. It also features a sleeve for tablets and mesh side pockets for drink bottles. This will surely fit all of your toddler’s need for a school day, road trips, and even as a carry-on during flights. It also has a padded back and wide shoulder straps for added comfort. The shoulder straps can be quickly adjusted using slide buckles. The breathable mesh panels provide good airflow. This can avoid too much sweating and keep the kids comfortable even on hot days. The bags are super safe since they are completely lead and BPA free. Zippers are made to be large so that it will be easy for kids to work on. For easy opening and zipping them close without fumbling. Dimensions: 11 x 6 x 12 inches. These adorable backpacks are made of 80% TPE and 20% Nylon. They are specially designed for toddlers and preschoolers, so it is just the perfect size for them. These bags are easy to clean, they can be washed by hand and are also machine washable. Dabbawalla bags are crafted and made that are recyclable, toxic free, BPA free and contains no phthalates, lead and PVC. The straps of these bags are super soft and flexible. They can be adjusted from the inside and can be pulled tight when they are not in use. Compartments and pockets are found inside and outside for perfect and super organized toddler stuff. Kids love how the colors of these tiny backpacks are super vibrant. They also come in different designs such as animals, airplanes, and cars. Giving your little ones a range of designs to choose from. Dimensions: 10 x 6.5 x 12 inches. The toddler backpacks from Wildkin inclines to be more of a traditionally designed backpack. They have just the right size perfect for packing all the essentials for school, daycare, travel, or trips to the mall. Your kids will love wearing these bags because they are lightweight and comfy. They’ll also be super excited to show off the fun and eye-catching designs of their little backpacks. The shoulder straps are padded and adjustable, and the durable top handle of this bag is also perfect for hanging. Despite being very light, this backpack is the perfect size for your kids. To fit in their school materials, snacks, extra clothes and other stuff they might need. Compartments of this bag are zippered so it will be easy for you and your kids to organize things. With this bag, you also won’t need to worry about another bag for lunch. The front pocket of this bag is zippered, insulated, and food-safe. So it effectively doubles as a lunch and snack compartment. You don’t need to worry about the trouble in cleaning food spills since it is very easy to clean and dries quickly. For the drinks, this bag also has a side mesh pocket to keep them in place. Reflective tape is featured on the exterior of the front pocket. This is to help keep your kid safe and seen when it’s dark. These backpacks also coordinate with the other Wildkin gears. Dimensions: 12.2 x 4.7 x 13.4 inches. 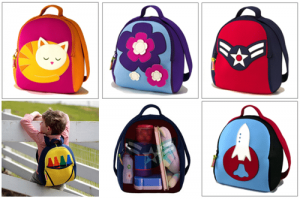 These modernly designed backpacks are not only the kids’ favorite, but also the parents’. The colors and prints of these bags are more of the pastel side compared to the usual bold and vivid colors. They come in flower, princesses, cars, and other patterns that will surely be loved by your kids. The bags are made of outer laminated fabric. It is waterproof that is why it is so easy to wipe them clean. The Urban Infant Packie is more of a school type bag. That is why it is designed to fit most standard preschool cubbies. Additionally, it has a patented art tube or silo. This allows your preschoolers to take their homework or art masterpieces rolled up safely until they arrive home. The zippers on this Packie are oversized so that the little kids won’t have a hard time opening and closing the bag with their little hands. It includes a compartment inside and a D ring on the side. It also has perfectly hidden clips to attach other Urban Infant accessories such as lunch bag or pencil pouch. These matching accessories are sold separately. Even at the age of 2, it’s important that your kids get to learn to take care of their belongings. And when they start to carry their stuff in a backpack, it is you who will be there to help them develop their sense of responsibility. So how can you do it? First, you must give your little kids ownership over their tiny backpacks. Let them practice wearing it on and taking it off on their own. It is also super important that your toddler will not have a hard time working with the zippers and buckles. A good way for them to learn is through showing them how you pack their bags. In that way, they can eventually do it on their own. If they get used to, let them pack their bags when off to some adventure or off to school. At the end of the day, when they come home, it is also nice if they learn to unpack the things that should not stay inside the bag overnight. Educate them on what stuff should go into their backpack and what should not. Most importantly, let them see you while you write their names and other important details on their respective backpacks. Show your toddler that you are writing for identification. Explain to them that should be the only time and only reason a backpack should be written on. For the reason that everyone will know that it is theirs. 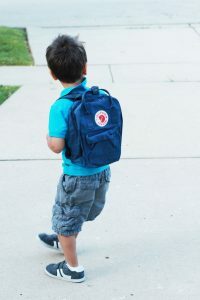 How can little toddlers use and carry a backpack in a safe way? Avoid overloading. Be mindful of the contents of their bags since even a slightly heavy pack can make a tiny child fumble. This happens most especially if climbing up the stairs or walking on uneven pavements. Do not let the straps let the bag hang too much. Make sure to make them tight enough that the bag is close enough to the body while keeping them comfortable too. A shorter strap will help distribute weight evenly. Dangling straps can be dangerous too, so if you need to you can chop off the straps if they tend to be longer than what is appropriate for your child. Help your child get used to wearing both backpack straps. Using two straps will prevent shoulder strains, back pains, and discomfort in the neck muscles. Before buying a stroller type of backpack for your future trip, check if your little one can be comfortable in walking while pulling and pushing the wheeled pack. If they’re having a hard time, it would be ideal to skip strollers for now.